The lives of 22 crew from a distressed fishing vessel were saved this morning – minutes later their boat sank. SAMSA’s MRCC coordinated the rescue efforts near Danger Point off the Cape South Coast. 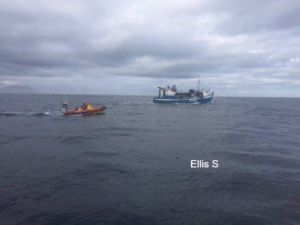 The fishing vessel Ellis S, owned by Sevlak Investments, sunk after the crew was rescued. The vessel took in water. Approximately three to four meters waves with wind blowing at around 30km per hour was experienced. First on the scene was Singaporean flagged motor tanker Aral Sea, followed by the I&J fishing vessel Fuchsia, and lastly the Realeka. 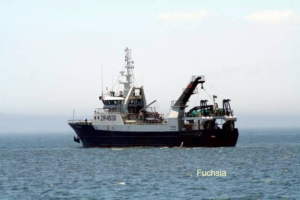 All crew members were brought to safety on board the Fuchsia at 02h38 on Friday morning. The distressed vessel sunk at 03h30 after the crew was saved from it. The Fuchsia proceeded towards Hermanus. With the assistance of the NSRI the crew of the Ellis S were taken ashore to waiting medical services and other relevant authorities who attended to them.